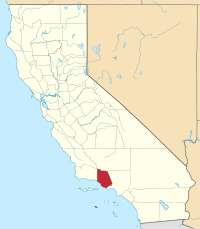 Ventura County is a county in the southern part of the U.S. state of California. As of the 2010 census, 823,318 lived there. The county seat is Ventura. Ventura County includes Oxnard-Thousand Oaks-Ventura, CA Metropolitan Statistical Area, which is also part of the Los Angeles-Long Beach, CA Combined Statistical Area. It is the southernmost county along the California Central Coast. ↑ "Mount Pinos". Peakbagger.com. Retrieved March 13, 2015. ↑ 3.0 3.1 "Ventura County QuickFacts". United States Census Bureau. Retrieved April 11, 2015. ↑ "State & County QuickFacts". United States Census Bureau. Retrieved May 31, 2014. ↑ "Central Coast". California State Parks. California Department of Recreation. Retrieved July 26, 2014. This page was last changed on 17 September 2018, at 16:40.